As for the origin of species, the question of the origin of blood during development has unleashed a lot of passion among the scientific community. As a matter of fact, the failure to derive blood stem cells (haematopoietic stem cells, HSCs) from pluripotent stem cells (stem cells that can generate any type of cells) has generated a lot of frustration for many scientists and has emphasized the need to understand how HSCs first arise during development (read more on HSCs here). Various researchers have shown that, in the mouse embryo, HSCs emerge in the dorsal aorta (the ancestor of the aorta artery) in a step-wise manner: endothelial cells lining the dorsal aorta first commit to the haematopoietic fate (they start to express the surface marker CD41), and further transition to haematopoietic stem cell fate with the expression of the surface marker CD45. Each of these transitions is tightly regulated by precise stage-specific molecular mechanisms and these been under intense scientific scrutiny. In a recent report published in Development, Liakhovitskaia and colleagues show that the transcription factor Runx1 is not necessary for the first haematopoietic commitment to CD41+ stage but is essential for the commitment to the CD45+ HSC stage. In the picture you can observe the dorsal aorta of a normal mouse embryo at day 10.5 of development. Blue corresponds to the DNA contained in the cell nuclei. 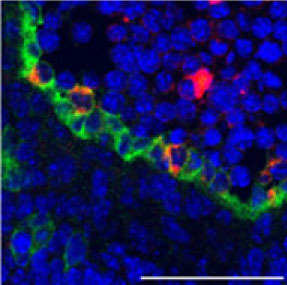 The lining of the aorta is composed of endothelial cells marked by CD31 (green) from which some express the first blood commitment marker CD41 (red). These CD31+CD41+ cells are thought to be the immediate ancestors of HSCs. Interestingly, the authors further observe that similar CD41+ (red) cells are present in the dorsal aorta of embryos from which the protein Runx1 has been deleted, showing that Runx1 deficiency does not prevent the formation of CD41+ cells. However, Runx1 deficient embryos fail to develop CD45+ HSCs, showing that Runx1 deficiency prevents the progression towards HSC lineage. Altogether, this report provides a better understanding of Runx1 dependent checkpoints during HSCs development. This small step is another forward step towards the understanding the origin of blood and hopefully towards the generation of HSCs from pluripotent stem cells.